Join Billy Bob, Billy Joe, and Billy Billee as they mix NASCAR with Beethoven, lite beer with Puccini and even kick up a little dust with Ave Maria Dixie! You`ll travel with our 3 singing cousins from their modest beginnings in Paris, Texas, where they discover that belting out a high C causes pigs to move faster and bar brawlers to scatter; all the way to their triumphant debut at New York`s famous Carnegie Hall. A native of California, tenor Matthew Lord is recognized as a versatile performing artist with a voice capable of encompassing repertoire from the 18th Century to works by composers of today. His stage work is consistently praised for its naturalness, intensity, and commitment. His engagements include the San Francisco Opera production of Peter Grimes, A Streetcar Named Desire and Turandot. Mr. Lord also has performed in The Crucilbe (Washington Opera), Mice and Men (Cleveland Opera), L`Incoronazione di Poppea (Utah Opera), The Love for Three Oranges (Portland Opera). Other companies Lord has performed with include: Opera Theatre of Saint Louis, Glimmerglass Opera, Tulsa Opera, Lyric Opera of Chicago, Berkshire Opera Company, Opera Delaware, Dallas Opera. Prolific in all kinds of music, Mr. Lord also performed in Andrew Lloyd Weber`s Phantom of the Opera as Piangi in the Hamburg Germany production. Lord`s concert appearances include engagements with the Detroit Symphony, the Juilliard Orchestra and Santa Fe Symphony. Mr. Lord was also a member of the prestigious Juilliard Opera Center. In January 2004, Mr. Lord made his Metropolitan debut in Boris Godunov. Alex Bumpas is a high energy, up and coming tenor who is well versed in opera, oratorio, recital, and concert performances. Mr. Bumpas has been a soloist in many professional organizations including the Dallas Symphony, Dallas Bach Society, Orchestra of New Spain, and Orpheus Chamber Singers. He has performed with and attended the Seagle Music Colony in New York and Festivalia di musika al Casalmaggiore in Italy. In addition to singing, Mr. Bumpas is also an accomplished trumpet player having performed with artist such as Steve Tyrell, Larry Willis, and former Blood, Sweat & Tears saxophonist Bill Tilman. Mr. Bumpas recently recorded a 21st century oratorio with the Russian National Orchestra entitled Every Matter Under Heaven by L. Johnson. The native Texan holds a bachelor degree in vocal performance from The University of North Texas. Blake Davidson is acclaimed for his versatility in opera, orchestral works, operetta, musical theatre, and in demand for leading roles in premieres of new works. The Dallas Symphony presents Blake on A Dallas Christmas Gala CD. His many appearances with the Dallas Symphony include Bravo! Vail, where he partnered with Sylvia McNair, as well as many Broadway and Christmas concerts. Performances of symphonic works and semi-staged operas include the Auckland Philharmonia, and Dallas, Florida, and Fort Worth Symphonies. He can be heard as Bob in Menotti`s The Old Maid and the Thief, released by Albany Records. Blake`s extensive musical theatre engagements include Casa Manana, Dallas Summer Musicals, and many symphonic Broadway concerts. His musicals roles include Juan Peron in Evita, Fred Graham/Petruchio in Kiss Me, Kate, Billy Bigelow in Carousel, Caiaphas in Jesus Christ, Superstar, and Emile de Becque in South Pacific. Opera engagements include Dallas, Sarasota, Anchorage and semi-staged operas with the orchestras of Fort Worth and Auckland Philharmonia. Redneck Tenors - A New Musical Adventure is the original hit national touring show written and directed by opera star Matthew Lord and musical arrangements by award-winning composer Craig Bohmler. The two-act, 19-song musical production is the story of three yokels from Paris, Texas including Billy Bob, Billy Joe and Billy Billee who happen to have big-time operatic voices. An enterprising Colonel discovers the boys and guides them on the search for the perfect venue - from rasslin` matches to Medieval Times to a Masonic Lodge to a livestock show, and more - all the way to the big-time destination of Carnegie Hall. Along the way, you`re treated to an incredible musical adventure packed with unbelievable tunes and of course, lots of laughs. The boys have finally made it to the Great White Way - trailer and all - smack dab right in the middle of Times Square. Although the Colonel and the boys have finally found the perfect venue, they`re now on a quest to find the perfect show! Join our 3 singing cousins as they stampede their way through Broadway`s greatest hits! You`ll hear them belt out their version of tunes from such favorite shows as "Phantom of the Opera," "The Sound of Music," "Little Orphan Annie," "Les Miserables," "A Chorus Line" and many others. Join Billy Joe, Billy Bob and Billy Billee as they put the odd in Broadway for a roof-raising, unforgettable good time. Those singing trailer park angels are packing their festive Christmas mullets and will be dashing through the snow just in time for some down-home holiday cheer. Performed by the same great cast of the hit 3 Redneck Tenors - a New Musical Adventure. These real life Broadway and Opera stars are ready to warm your holidays with classic, pop and deep-fried feast of musical delights. The familiar holiday tunes in the show include classics like: Sleigh Ride, White Christmas, I`ll Be Home for Christmas, Santa Baby, Santa Claus is Coming to Town, Blue Christmas, O Holy Night, Winter Wonderland, Jingle Bells, and Silent Night. You`ll also enjoy holiday spoofs like Grandma Got Run Over by a Reindeer and I Saw Mommy Kissing Santa Claus and a few other great surprises! Buckle up for a musical extravaganza (which is Italian for super buffet). These boys are actually classically trained artists from Broadway and world opera stages cleverly disguised as mullet-wearing Billy Joe, Billy Bob and Billy Billee. The show is unlike any typical concert - it`s serious big city music and a few down home laughs! 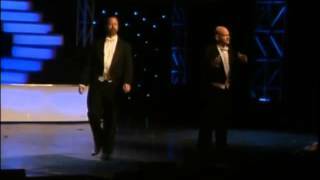 3 Redneck Tenors in Concert is 90 minutes of full throat singing like you`ve never heard (or seen!) featuring a variety of musical selections and styles sung by these musical virtuosos. The program includes some great humor and fun all hosted by the Colonel - who also happens to sing in a few of the numbers.